The Oregon Symphony didn’t look far afield to find top notch guest artists for its concert on Saturday (February22). 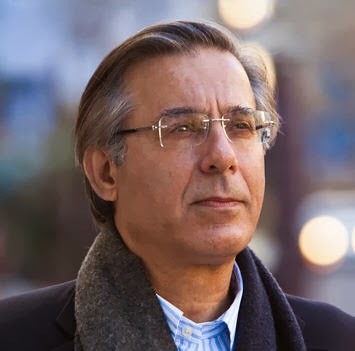 Carlos Kalmar and company teamed up with Portland Piano International’s Arnaldo Cohen to deliver a riveting performance of Rachmaninoff’s Second Piano Concerto. They also collaborated with the women of the Portland State Chamber Choir to create a very atmospheric mood in Debussy’s “Nocturnes.” Without guests, the locals of the orchestra and Kalmar (who has made his home in Portland), polished off a very satisfying interpretation of Haydn’s Symphony No. 53 (“L’Impériale”). The big draw on program was the Rachmaninoff piece, which is one of the most popular piano concertos ever written because of its gorgeous themes. The first few minutes of the performance on Saturday evening got off to a robust start, but the orchestra was just a tad too loud for the first few minutes until Cohen got to the first theme. From that point on, a mind meld between soloist, conductor, and orchestra occurred and the performance became pure magic. Cohen effortlessly dazzled the audience with playing that sparkled and shimmered in the fast sections and became tantalizingly dreamy in the slow ones. The orchestra augmented his playing with stellar dynamics that kept the piece moving forward. Brilliant solos by principal horn, John Cox and principal clarinetist, Yoshinori Nakao added to the luster of the performance. The audience practically jumped up to applaud the performers after the glorious finale and was rewarded with an encore that splashed through the finale again. The concert began with Debussy’s “Nocturnes,” which is divided into three movements that evoke Clouds, Festivals, and Sirens. In the first movement, it was easy to imagine clouds adrift as the orchestra painted a mysterious and serene mood. The rising sequence of notes from Kyle Mustain’s English horn added a beguiling, hypnotic element. The second movement featured pulsating sounds from the woodwinds, a rolling series of notes from the flutes, a procession emanating from harps and timpani, and a fanfare of trumpets from afar. The choir of women in the final movement placed a radiant thread of ahs on the sonic tapestry of the orchestra. The overall effect was soothing and enchanting and worthy of the sirens of Greek legend. The first half of the concert ended with a lively interpretation of Haydn’s Symphony No. 53 (“L’Impériale”). The strings of the orchestra shone in all facets of the piece, whether they fashioned passages of smooth elegance or skipped along playfully. Their blend was exceptional, and they explored all sorts of little dynamic nuances along the way. It was a delight to hear and a reminder of how exceptional this orchestra has become in playing pieces from every era of the classical repertory. 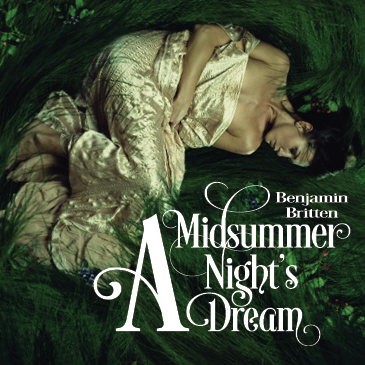 PSU Opera to present Britten's "A Midsummer Night's Dream"
A Midsummer Night’s Dream is the most beguiling and enchanting of all Benjamin Britten’s operas. It is a work with spellbinding atmosphere that inhabits a truly unique dreamlike world. Monday, February 10th at the Arlene Schnitzer Concert Hall saw the Oregon Symphony present a varied program consisting of Lutoslawski, Beethoven, and a cello concerto by Schumann, featuring guest conductor Mark Wigglesworth and guest artist Johannes Moser on cello. Following a wild weekend of concert cancellations or alterations all across Portland's musical map due to weather (including OSO's Sunday presentation of this performance) it was nice to hear business as usual at the Schnitz. Opening with Witold Lutoslawski's Symphony No. 4, the OSO wasted no time getting right into a meaty program. The opening was spookily inviting and immediately engrossing--uneasy atmospherics, an ominous, discordant clarinet coming in almost like an afterthought but steadily growing more insistent, and scritching, toneless glissandi on the harp all added to the effect. Later it continued with a plaintive meowing on the violin and a ghostly tootling on the portative that was almost not there at all. All throughout Lutoslawski paints a gloriously inviting sound picture, intuitively realized by the OSO. What does one make of it all? Listening to a piece like this reinforces the importance of live music: as much as I enjoyed this work, it wouldn't be first on my list of CDs I wanted for Christmas. But listening to the work live, it works its way into the consciousness on a subterranean level, demanding to be heard--it will not accept anything less. It is more like Pollock than Rembrandt...maybe it does or doesn't represent something specific, but boy does it command attention. The Schumann Concerto in A minor for Cello was a stark contrast to the opening work. Moser brought intensity and passion to a remarkably controlled and deft touch. He was not afraid of bold attacks and employed a delicious, ungainly decussation of his cello to achieve certain effects. During the more rapid pieces he stared directly at the violins, as if challenging them to meet him for a duel in the midst of the tempest, and from an ensemble perspective this was nicely done--the final accelerando was as natural and unforced as one could want. Despite occasional pitchiness from the soloist, this was more interesting and enjoyable than Schumann typically is for me. The second half was Beethoven's beloved Symphony No. 7 in A major. The OSO brought a crispness to the tone and tempo--no malingering over favorite phrases was allowed. When done properly, it's always fun to hear an old chestnut dusted off--no need for showing off or grandstanding from performers, and as a listener it's most enjoyable to leave off contextualizing in these circumstances--let the rest of the 19th, 20th and the infantile 21st century stand aside, and one can hear the music for just what it is, to hear it as when one was a child. 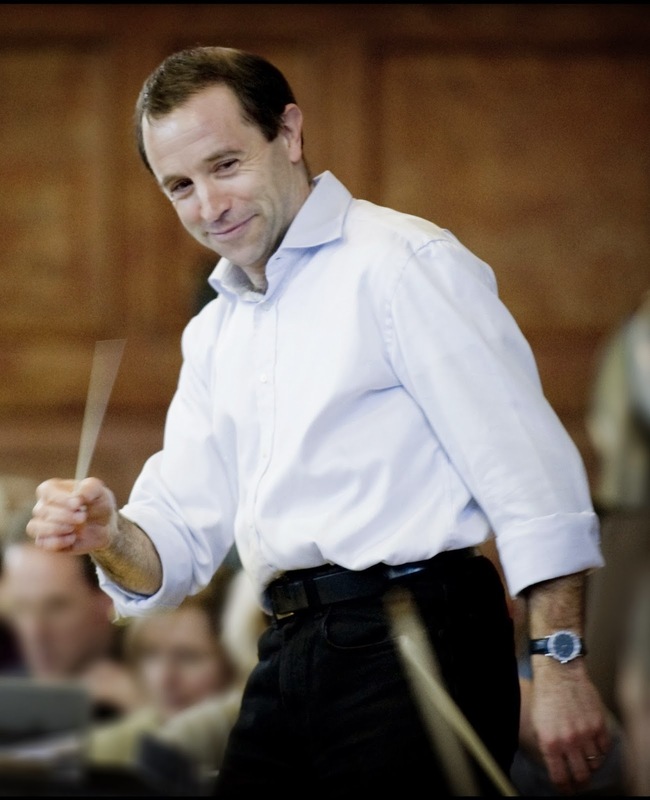 The conductor and orchestra must provide the space for that to happen, and guest conductor Mark Wigglesworth certainly allowed for that. The deftness with which OSO approached this--not belaboring Beethoven's elemental use of syncopation letting it live right where it's supposed to in the music--'it is what it is,' to use the parlance of our times. The glorious swelling and receding of the dynamics in the first movement, the solemn chanting from the low strings as the counterpoint reveals itself in the second, and the way the third snaps us out of our reverie with its unflagging pace and exuberance--these are all things we expect from such a well-known work, and perhaps the greatest praise one can say about a performance is that everything that should have been there was, and in its proper place and time. When that happens, the music is glorious, important and satisfying, and Wigglesworth along with the OSO provided all that in this outing. It’s rare when the weather wreaks total havoc in Portland, but that’s what happened last week when a number of concerts were cancelled because of a combination of snow and ice build-up all over the metro area. But the dicey conditions didn’t stop the show at Portland Opera, which went ahead with its final two performances of Donizetti’s “Lucia di Lammermoor.” I didn’t get to see how things went on Thursday evening when snow had caused massive traffic jams all over the city, but I did get experience the production on Saturday (February 8th) after two days of snow had encrusted the streets and nobody was driving nowhere. Fortunately, one of my neighbors used to be a ranger at Yosemite and has an all-wheel drive Subaru. He carefully drove downtown with ease and parked in a lot near Keller Auditorium where I usually park. No attendant was stationed in the cold (it was around 25° F) to collect the parking fee; so we joined the handful of other vehicles and gingerly walked over to the Keller. Though sparse, the atmosphere in the lobby of the Keller was decided buoyant, with people dressed mostly in business casual plus sturdy footwear. One Portland Opera staffer was managing the ticket booth all by herself until the company’s general director, Christopher Mattliano, and the director of production, Laura Hassell, came to the rescue. As I found my seat on the main floor, I took note of the low attendance and then noticed one thing that was strikingly absent: there was no sound from the musicians in the orchestra pit warming up. That made me get up and walk down to take a look. Ah! There was no on in the orchestra pit, except for one man sitting at a grand piano and looking over a score. That’s when I took this photo of the audience. Within the next few minutes, Mattaliano came to the front of the curtain and explained that since the members of the orchestra come from all around the Portland metro area, they were unable to get to the auditorium because of the inclement weather. He invited everyone in attendance to come forward and fill the front area as much as possible. The principals were ready to go and they would be flying out of Portland to their next gig the next day… weather permitting. He also said that chocolates would be handed out gratis in the lobby during intermission. After the reassembling ourselves closer to the stage, the lights went down, conductor George Manahan appeared in the opera pit and took a bow, and the production was underway with chorus master Nicholas Fox at the keyboard. For anyone who has read this far but doesn’t know the story of “Lucia di Lammermoor,” here’s a brief synopsis. Lucia is a noblewoman whose brother, Enrico, wants her to marry a wealthy man, Arturo, who she does not love. She loves, instead, Edgardo, the rival of Enrico. But some years beforehand, Enrico killed Edgardo’s father and usurped his family’s land to boot. Using a forged letter, Enrico convinces Lucia that Edgardo is unfaithful. So she reluctantly signs the wedding contract, but on her wedding night, she goes mad, murders Arturo, and then dies. Crushed by the news of Lucia’s death, Edgardo takes his own life. The action takes place in 17th Century Scotland and was inspired by Sir Walter Scott’s “The Bride of Lammermoor,” which was loosely based on a real tragedy between two families in Scotland. Elizabeth Futral, making her debut with Portland Opera, created a passionate Lucia, but Futral’s vibrato was often on the wild side. Still, her mad scene, augmented by Fox’s light touch on the piano that deftly imitated the flute part, was a highlight of the evening. 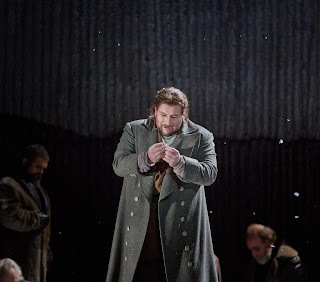 Scott Ramsay, also in his debut with the company, sang the part of Edgardo with an almost lyric tenor quality, which worked best in the scenes with Lucia, but it need to be more gripping in the final scene. Weston Hurt, as Enrico, was the embodiment of wickedness and pride. Peter Volpe, was ramrod straight and haughty as the chaplain and tutor Bidebent. Ian José Ramierez sang ardently as Arturo, and Carl Halvorson commanded the stage as the captain of the guard, Normanno. Melissa Fajardo provided understanding compassion as Alisa, Lucia’s companion. The chorus, which seemed to be missing a fair number of women, more than held its own, and Manahan kept the enterprise afloat with spot-on gestures and a wonderful pace that worked well on all sides. But the real hero of the day was Fox, who, with his agile and evocative playing, represented an entire orchestra. I went down to the orchestra pit during intermission and saw him looking over the score with the utmost concentration. I’m not sure that he had much warning that he would be the accompanist that evening. In any case, he really saved the day. Directions by Doug Scholz-Carlson were crisp, but, in general, the men seemed stilted against Futral’s natural and fluid portrayal of Lucia. The scenery, constructed by Minnesota Opera in a production created by James Robinson with sets designed by Christine Jones, worked very effectively with the story, especially the large partitions with the vertical grain that suggested a remote and rugged landscape. The slanted tables that were used in the wedding scene enhanced the off-balanced mood of the story. The one humorous moment came when (fake) snow fell at the beginning of the scene when Lucia visited the grave of her mother. That caused the audience to chuckle. Another high point of this production was the wonderful use of lighting, designed by Scott Zielinski and recreated by Scott Bolman, from the front of the stage. It projected ominous shadows of the principals on the huge walls in the background. Everyone in the production seemed to be giving 150 percent, and that made this “Lucia” a rewarding experience. Before the start of the second act, Mattaliano announced that Tri-Met had stopped the Max lines. So it was no wonder that as the cast came out for its bows, the chorus didn’t appear. They had already gone home. Here's a photo of opera patrons at the chocolate table. Despite the snow, performances by the Portland Opera and the Portland Baroque Orchestra will take place as scheduled this evening. If you can get one of these performances, you will probably be able to purchase a ticket from subscribers who will not be venturing out in the snow. I'll be at the Keller this evening to hear "Lucia di Lammermoor" and hope to take a picture of the crowd inside. I'll review the production in the next few days. Gold Medalist of the Fourteenth Van Cliburn International Piano Competition, pianist Vadym Kholodenko dazzled audiences in Portland at his Portland International Piano recital February 3rd at Lincoln Hall. Kholodenko brought to the stage a stunning array of virtuosity, altogether bound with an incredible musical depth. Nikolai Medtner's "Forgotten Melodies" filled the first half of the program, dense with color and vivid imagination. Kholodenko's rich, golden sound breathed life into Medtner's various characters, rapidly ever-shifting textures and personalities. His execution of the piece was so profoundly engaging and enthralling that it left you suspended in time even after the audience leapt to its feet in a standing ovation. Equally technically and intellectually brilliant, the second half consisted of Rachmaninoff transcriptions of various works: a Bach violin Partita, Schubert's "Wohin?," Mendelssohn's "Scherzo" from "A Midsummer Night's Dream," Tchaikovsky's "Lullaby, a polka by Franz Behr, and Kreisler's "Leibesleid and Leibesfreud." Kholodenko effortlessly mastered the challenge of stylistic merging of Rachmaninoff and each individual composer with unrivalled technical command and a captivating range of touch. He kept an erect posture, drawing strength from his back for thunderous, yet always clear and defined, sound. Softly voiced moments were unparalleled in beauty, and the Mendelssohn "Scherzo", the Italian term for "joke", was effectively humorous and devilishly charming. Countless curtain calls and two encores (Liszt's "Paysage" and Chopin's E Minor Mazurka) concluded the evening, a performance of a musically robust virtuosity. The 27-year-old Vadym Kholodenko is truly an artist of high caliber, vibrant, and delightfully tasteful. Tenor Scott Ramsay talks about his career and "Lucia di Lammermoor"
Portland Opera's current production of Lucia di Lammermoor stars tenor Scott Ramsay as Edgado, the star-crossed but ill-fated lover of Lucia. This is Ramsay's debut with Portland Opera. Edgardo is considered his signature role. 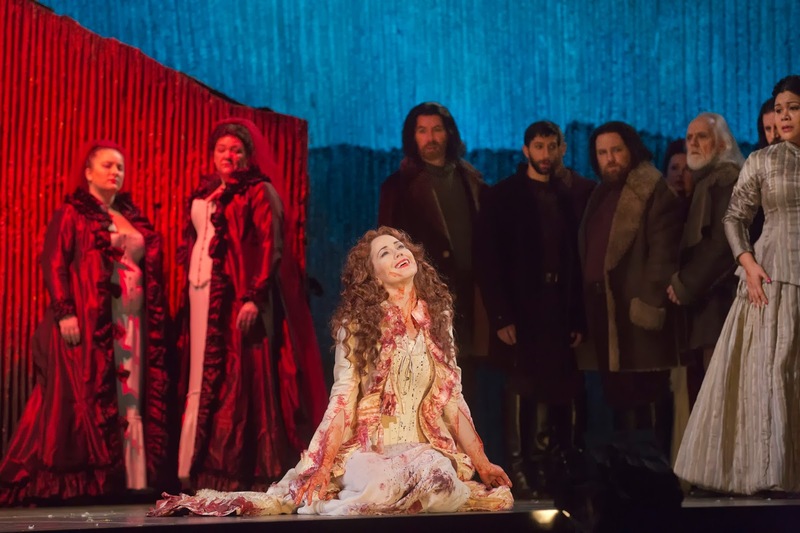 He has sung it at the Lyric Opera of Chicago opposite Natalie Dessay, Dublin International Opera Festival, Kentucky Opera, Anchorage Opera and New Orleans Opera, among others. When did you arrive in Portland to start working on Lucia? I got here on the 6th or 7th of January and have been working hard to help get all of this put together. We’ve had some time to enjoy the city and the surrounding area as well. We’ve had some gorgeous weather, too! How many times have you sung the role of Edgardo? This will be my tenth production! Actually, it’s my tenth production in ten years! I find the role you will be singing, somewhat unusual, because you have to sing earlier in the opera but then you’ve got a full load at the end and have to carry the opera. It’s very interesting the way that this opera is set up. There’s a duet in the middle of the opera that opens the second act. It’s a duet between Enrico and Edgardo, a kind of confrontation scene where they challenge each other to a duel. It’s great musically and adds to the story, but lot of times, this duet is omitted, because it uses an extra scene, which means another set. So a lot of opera companies won’t do it because of the cost. But in the Portland Opera production we will do it, and it’s my third time to do this scene. I’m really looking forward to singing it. For Lucia, how high do you have to sing? In the duet with Enrico, there’s a cadenza that goes up to a high E flat. That’s normally the way that I do it, but in this production they want it done a different way.So in this production, the highest note is a B natural. Okay, so that’s got to be easy pie for you! [Laughs.] For some reason that B natural – just shy of a high C can be a lot more difficult than you’d think – especially at the end of the night. It’s funny that with singing this role in this opera, I have to change my sleep patterns. I have a lot of singing to do after 10 pm. I try to stay up until 1 or 1:30 in the morning so that I am more energized and it all feels natural when I have to sing so late in the evening. How did you get drawn into singing opera? Were you always singing a lot as a kid? I grew up in Green Bay, Wisconsin. It’s famous for its football, and I’m a big Packers fan and grew up playing football. I got into singing through school choir and some local community theater. When I was in seventh grade, I had a teacher in school say, “You are so loud and you’ve got a big voice. You should be an opera singer.” I laughed when I heard that. I didn’t know what an opera singer was. But I started doing some community productions outside of school. My parents kind of pushed me into that area. I started singing in an opera chorus when I was in high school. We had a small opera company in Green Bay. I think that the Merry Widow was the first opera that I was in – singing in the chorus. There was something about it that kind of hooked me, but I didn’t return to it until college. I went to college to study music, and I really wanted to be a high school choir director. So, I took some voice lessons, and my teacher said, “You know what. You should be a performance major and look at minoring in education.” The minute I did an opera workshop – we did a scene from Verdi’s “Falstaff” – I was hooked. This was great. It had theater and music, and it was challenging. When I had done musical theater before, the directors always told me that I was great, but I was too loud. So, I started to train and learn how to sing opera. I had to learn how to project. At first I went to the University of Wisconsin at Stevens Point and then to Milwaukee. I finished college there and sang in the chorus of the Florentine Opera and the Skylight Music Theatre. I got to see how professional singers did it. There was no one moment when I decided that this is just what I’ve got to do. It just happened. I was singing in the chorus at the Florentine and was approached by one of the directors there, Bernard Uzan. He and his wife, Diane Soviero, were running the young artists program at Florida Grand Opera. I asked me to audition, and I did it, and got a position I the young artists program right after I finished my undergraduate work. So, it became my grad school. Then it kind of hit me that I’m actually doing opera singing as a profession. You’ve done a lot since then, because you’ve sung all over, including at the Chicago Lyric. That was the first place that I sang “Lucia.” It was during my final year there. I had been singing there for three seasons. “Lucia” became my break. I had been an understudy for Edgardo and had been singing the role of Arturo. This happened to be the first production that Natalie Dessay would do in Italian. The Edgardo was Marcelo Álvarez. He had done the role many, many times, but didn’t want to rehearse it in Chicago during a cold February. So, I go to rehearse with Natalie Dessay for two weeks. The director was John Copley who said that I would get treated as if I would be the tenor who would go onstage in case Álvarez didn’t come. Well, Álvarez did come and sing, but before the final performance, which was going to happen on his birthday, he decided that he didn’t want to do it. Natalie then put her foot down and said that I want Scott to do the role because we’ve rehearsed it. So that was my big break. It was the whole opera with the Wolf’s Craig scene, all in the original keys, and a big audience. It was a night that I will never ever forget. And another thing that happened during that time was a writer from the New Yorker, Bill Murray, who was following the young artists and some the stars at the Chicago Lyric around all year in order to chronicle us. He wrote about that night when I got to sing Edgardo in “Lucia.” He published that in his book called “Fortissimo: Backstage at the Opera with Sacred Monsters and Young Singers.” The sad thing is that he had passed before the book was published. Jumping back to Green Bay, have you been asked to sing at a Packers game? I actually have! It was about 10 years ago. I think that a friend of mine from church may have even posted it on YouTube. It was an NFC North Championship game, and I think that the Packers won it. It was wonderful exposure for me. A bunch of the players from that team went to my church there, and my pastor was the chaplain of the Packers. I’ve sung a number of chapel services for them. It’s been really neat to know some of the players like Aaron Rodgers. Opera singers travel a lot, because that’s part of the job. When you travel, how do you like to stay in touch back home with your spouse or partner? I have a partner who is in the administration at Lyric Opera in Chicago. When you are on the road, it’s tough. You have to make time for your relationships. I stay in touch with him and my family in Green Bay on the phone and with Skype and Facetime. That makes a world of difference. The most that I’m gone is three months at a stretch. But when the gig is over, I’m ready to go back home! I’m very fortunate, that Portland Opera treats opera singers like a family. People bend over backwards for the artists. The give us great housing. We get a bike to ride around the city. This is my first time here, but I’ve had friends who have sung here, and they say “Oh, just wait until you get to Portland and work with Portland Opera. It’s great.” I was just talking with my manager earlier this morning, and she said, “Every artist I have talks about how fantastic Portland Opera is with visiting artists.” On top of everything, I have a lot of friends who have moved to Portland from the Midwest. So, I’m really enjoying reconnecting with them. What are you doing after Portland? What do you recommend for singers that is most helpful? Be sure to drink enough water. Keep hydrated, and get enough rest.